Discussion in 'Mayberry Lounge' started by Strange King, Aug 10, 2015. This is an under the radar film. Nothing to be put on anyones all time list but this movie was pretty solid and just came out on Netflix. 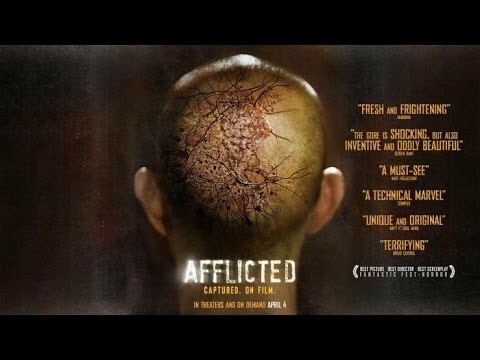 Afflicted is a 2013 Canadian found footage horror film that was written and directed by Derek Lee and Clif Prowse, and is their feature film directorial debut. It had its world premiere on September 9, 2013 at the Toronto International Film Festival, where it won a special jury citation for Best Canadian First Feature Film. Lee and Prowse also star in Afflicted as two friends whose goal to film themselves traveling the world is cut short when one of them contracts a mysterious disease. I saw this a little while ago, liked it a lot. One of the better "Found Footage" type flicks for sure. Hmm...never seen it. It was on my Netflix for a while, but it got such poor reviews. Maybe I'll give it a watch. Ya me too. I had it dvr forever. Last was bored n threw it on. StaRT of it was a Lil boring once the guy gets infected it gets better. Yep. It wasn't bad. I wouldn't go out of my way to watch it though.